For a humongous city bisected by a river, Bangkok has few bridges. 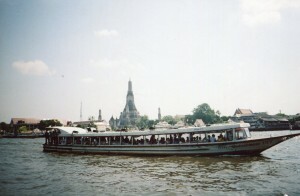 I had to take a boat to cross the river from the area around the royal palace to Wat Arun. But in the water, I found myself in Thailand’s spiritual heart. Four monks in orange robes placidly boarded and sat next to me. Their calmness and rippling gowns blended with the gentle water as we slowly approached the wat. 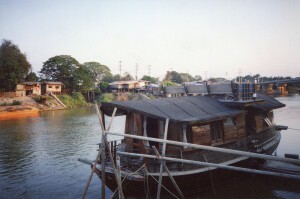 Lots of long and narrow vessels serve as taxis between both banks. Their hulls curve upwards at both ends as gracefully as a classical dancer’s hand movements. These boats blend with the gentle waters and the flowing forms of the monuments that they sail by. 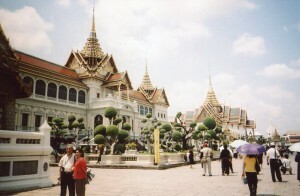 Shortly after Bangkok was established as the Thai capital in 1782, Wat Arun, Wat Pho, and the royal palace (above) were built. 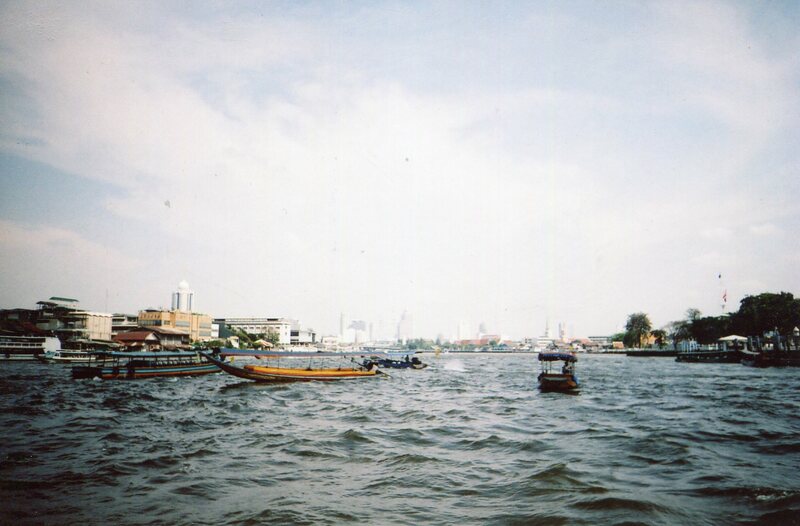 The palace and Wat Pho sprawl next to each other on the Bangkok side of the river, and Wat Arun is directly across. So Bangkok’s people see their towers together every day. They project lilting forms that slowly shift as people float by. The spires softly glow like pearls during sunrise and sunset. The last post looked at the West’s love of straight lines and static geometric forms. But Thais stress graceful flow in their art. It’s not static–it moves, but in a gentle way, like a river, a Buddhist procession, a classical dance, a long boat and the ways people amble in daily life. All these experiences blend in limitless ways, and they reinforce each other as basic reality. Thai temple spires are excellent examples of how art forms mirror all these dimensions in Thai life and thought. These blends reflect ways of life that are ancient. The above photo is from the capital which preceded Bangkok, Ayutthaya. And they go back much farther, to traditional village life. 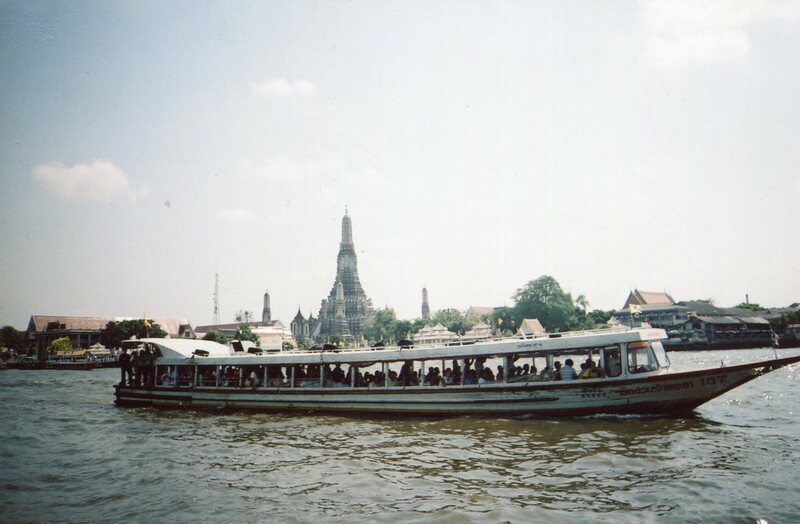 Bangkok’s royal palace, Wat Pho and Wat Arun, and the elegant boats flowing between them comprise enduring truth and order in the steamy modern city. The blends of delicately rippling forms are models of grace and serenity. And this focus on smooth undulating forms and motions reflects Thais’ ancient past. The art and ideas that a society finds most meaningful reflect an infinitely rich cultural landscape. If you have the time, Chang Mai is another good place to visit. Seems some temple there were constructed when the city was built (14th -15th Century) and are still standing. Lanna style buildings. Also, there’s a book called Makyung, The Mystical Heritage of Malaysia compiled by Rahimidin Zahari. An ancient theatre/ drama artform. Wayang Kulit and Kuda Kepang we know but seldom we hear of Makyung. And if you transit through Singapore, a visit to the Buddha Tooth Relic temple is recommended. I just arrived in Sukhothai today, from Chiang Mai. I enjoyed CM even more than I did when I was there 5 years ago. I instantly loved Lan Na art, so I went through more than 20 temples there. I also visited Nan, Phrae, Chiang Rai, Chiang Saen and Chiang Khong on this trip. All except Chiang Khong have great Lan Na art. I took thousands of pics. Thanks for the book title. I haven’t heard of Makyung either. I’ve transited thorugh Singapore before, but I never saw the Buddha Tooth Relic temple. Thanks for the recommendation. I might to back to India in early 2014, so maybe I’ll be able to see it then.